This week’s Flipped is up. Just out of curiosity, is negatively reviewing a Tezuka comic a mortal sin or just a venal one? I’m guessing it’s mortal, but I also figure it probably doesn’t matter at this point in my distinguished career. I mean, I’d put Blankets and New Frontier on the list of the Best Books of the ’00s I Couldn’t Force Myself to Finish Reading, and I’ll never repent that, so I’ve probably got a one-way ticket straight to comics hell with my name on it. As windy as this week’s column may seem, know that it’s the result of judicious editing on my part. I had this whole section mapped out about how, even though Swallowing has a lot of problems, you can see a lot of its ideas put to better use in Naoki Urasawa’s 20th Century Boys, but then I realized that if one started writing about the ways Urasawa repurposes Tezuka (really, really well, I hasten to note), it would be a five-parter. I know Friday is usually license request day, but when Matt Thorn stops by to list his five favorite manga of the current decade, you make an exception. Two are already being published in English and I’ve already made a plea for another, but that leaves two that sound amazing. 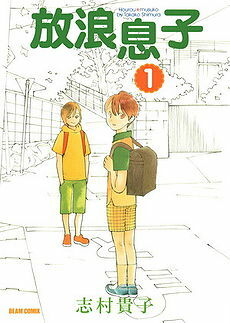 Wandering Son (Hourou musuko), by Takako Shimura, published by Enterbrain in Comic Beam: This one sounds very in the spirit of the Magnificent ‘49ers with its dramatic focus on gender identity and young love. According to Wikipedia, the series “depicts a young boy named Shūichi Nitori who wants to be a girl, and his friend Yoshino Takatsuki, a girl who wants to be a boy. The series deals with issues such as transsexuality, gender identity, and the beginning of puberty.” Comic Beam, as we all know, is a wellspring of terrific comics. Nine volumes have been produced so far. With Or Without Me (Watashi ga itemo inakutemo), by Ryo Ikeumi, published by Shueisha in Margaret: Going by my awkward translations of the text on Amazon’s French site, this one’s about a young woman whose life changes forever when she runs into an old schoolmate, now a successful shôjo mangaka. From what I can discern, a very dramatic and complicated love triangle ensues over the three volumes of the series. It’s been published in French by Panini as Dites-moi que j’existe, which suggests a certain level of angst, you know? 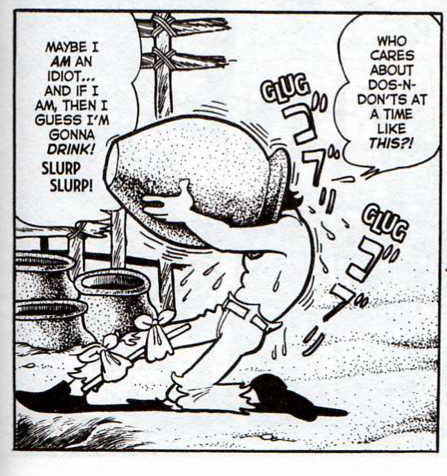 In other Thorn-related news, the noted manga scholar examines the state of translation and… well… see for yourself. You are currently browsing the The Manga Curmudgeon blog archives for the day Monday, November 30th, 2009.